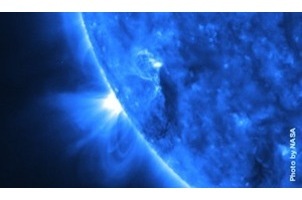 This is Venus’s moment in the sun. Not since 1988 have celestial circumstances conspired to create such a riveting presentation of the evening star. This is the best and brightest Venus we can possibly see. What makes this year so special? After all, every 19 months, Venus, Earth, and the sun repeat the same alignment with one another. But the tilt of Earth’s axis introduces a little variety into things and dramatically affects Venus’s visibility. That nearest planet is most easily seen when it appears farthest from the sun in the sky, away from the glow of sunrise or sunset. If its greatest separation from the sun happens to occur in the fall, then Earth’s tilt makes the evening star appear inconspicuously low in the sky. But if the same event happens in the spring, the picture is reversed, and Venus floats high in the twilight sky, almost vertically above the sunset; it then doesn’t set for several hours. That’s what makes 1996 a vintage Venus-viewing year. Then, just as in 1988, it keeps getting higher in the west, and brighter. And--count on it--some police stations and observatories will no doubt experience an increase in UFO reports as citizens stare suspiciously at the odd dazzling light, to which passing clouds sometimes impart illusory motion. One of the reasons Venus looks so dazzling is that its white clouds of sulfuric acid droplets bounce away 76 percent of the sunlight striking it. That’s just 10 percent less reflective than a mirror. Moreover, sunlight is 4 times more intense when it strikes Venus than when it reaches Mars, and 50 times brighter than when it arrives at Jupiter. So we’re seeing reflections of a more dazzling light to begin with. All this adds up to the most intense brilliance per unit of size of any solar system object except the sun. As Venus draws ever nearer to us during the next three months, it will double in brilliance, becoming some 600 times brighter than the North Star. By early May, Venus grows into a large enough crescent to be seen beautifully through ordinary binoculars. Later that month it falls into the twilight; it reaches its most northerly position of the twentieth century on June 1, when it sets as far to the northwest as any person now alive has ever seen it. Come July our cloud-shrouded neighbor reemerges like Houdini, ascending to a brilliant predawn spectacle since the ideal situation for a perfect evening star (a spring elongation, or farthest separation from the sun) creates the proper geometry for a first-class morning star as well. It’s feast or famine, and this year’s Venus banquet promises to sate us through summer and fall. Yes, it’s true that you’ll be able to see this fine choreography repeated in 2004, 2012, and so on. But consider: This is Venus’s last great appearance of the second millennium.